Solarpowergetics is a renewable energy company offering the most sophisticated solar technology in the world. Thunderstorms, gridlock, long lines, mudslides, brownouts, fires, floods, traffic accident, hurricanes, domestic disputes, tornadoes… No matter where you live, you are bound to find yourself in the middle of doing something important on a smartphone, iPhone, Tablet, or Notebook when the power suddenly stops flowing. Worse, the juice in the battery is depleted. The spare pack of batteries mysteriously disappeared. What next? Access to the best electronic gadgets is no longer a first-class luxury reserved for the jet set. In fact, for many of us, it has become a necessity. It links us to our livelihood, pays our bills, keeps us in touch with our loved ones, and so much more. To meet these growing electronic necessities, manufacturers have been finding ways to improve battery life. Solar power is making a grand entrance as an affordable, safe backup during an emergency. 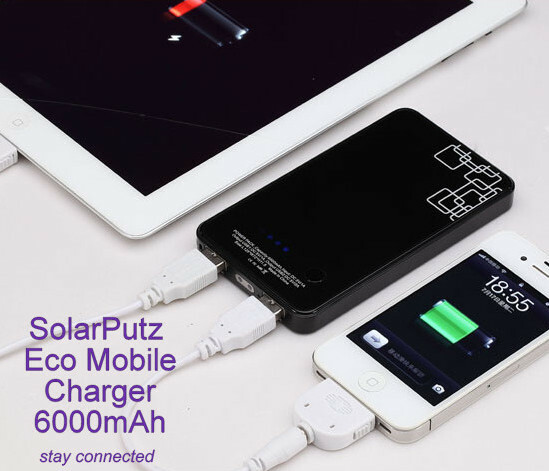 Compare other solar mobile chargers. Most of them trickle charge themselves through direct exposure to sunlight, but it takes a couple days to fully charge. For rapid “flash” charging, connect a USB to either a laptop or wall jack via an adapter. Once fully charged, solar mobile chargers provide ample power to continue operating and recharging your mobile device in an emergency. Don’t waste time playing with your Sudoku app. Call for help. Get the latest news on what’s happening around you. 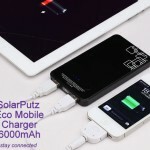 SolarPutz offers a complete line of solar mobile chargers starting under $25, as well as adapters, to plug into different walls for many countries. Their premium solar mobile chargers are specifically designed to protect electronic gadgets. They are safe and reliable. Whether you’re looking for a travel-ready solution or a clean source of power for your electronic gadgets, or a way out of a mess during a loss of power, skip the grueling minutes. Try a new experience today. Buy a SolarPutz Eco Mobile Charger, available in black, white or trendy red.